Deploy performance and capacity without compromise for your enterprise storage with the cost-effective Dell™ EqualLogic PS6110XV 3.5” 10GbE iSCSI array. Deploy performance and capacity without compromise for your enterprise storage with the cost-effective DellTM EqualLogic PS6110XV 3.5” 10GbE iSCSI array. Quickly process your data-hungry tasks with EqualLogic™ PS6110XV 3.5” arrays—high-capacity performance with easy, flexible management for highly consolidated enterprise environments. Implement enterprise-class performance and capacity with the PS6110XV 3.5” 10GbE iSCSI array, a Dell virtualized scale-out architecture for critical storage performance that is easy to manage and scale for future needs. 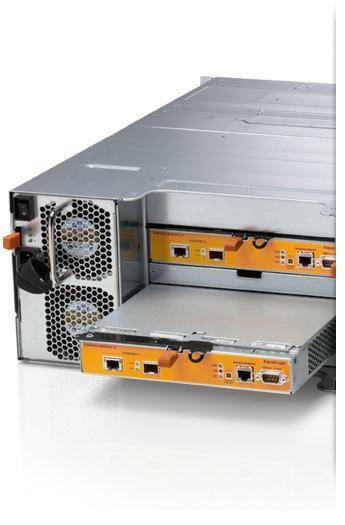 Flex your storage muscles with the performance, capacity and economy of the PS6110XV 3.5” 10GbE arrays. With high-performance 3.5” SAS drives, it offers similar performance to the PS6110XV with up to twice the capacity. It is an outstanding solution for critical enterprise-storage applications. 24 hot-swappable 3.5” 15K drives. Peer-scaling architecture that scales performance linearly. Vertical Port Sharing, designed to enable you to maintain full bandwidth if a networking port fails. Group Manager, which integrates all management into one console for both file- and block-storage protocols. EqualLogic Host Software that extends the functionality of the array-based software to enable cooperation with the host. Host Integration Tools for Microsoft®, VMware® and Linux® products as well as EqualLogic SAN Headquarters (SANHQ) management software.